By Noel Heinsohn I wouldn’t call myself an expert on identifying the species of random larvae. However, after four years of rearing fish from the Long Island Aquarium’s 20,000-gallon reef tank, I have to say that I have developed quite an eye for it. 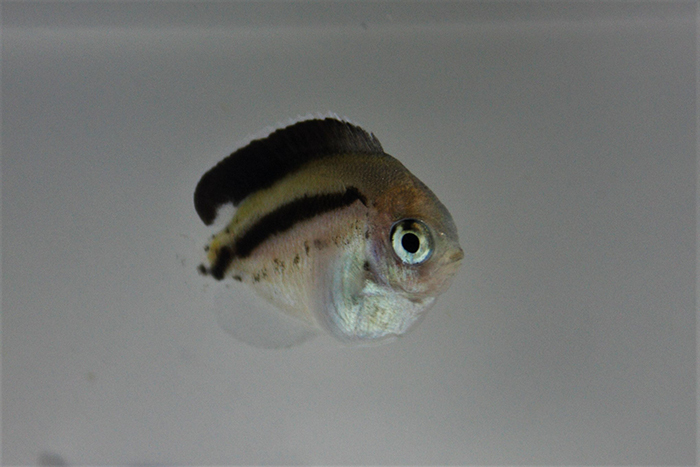 Between reading the work of other aquaculturists, the process of elimination, and my own experiences I can tell what most of the larvae species that come from our reef tank are by four days post hatch (DPH). Lately, I have been working with a lot of Anthias and Angelfish larvae. Being able to tell the differences really helps narrow down what I could possibly be raising out of 83 species and how best to cater to their specific needs. 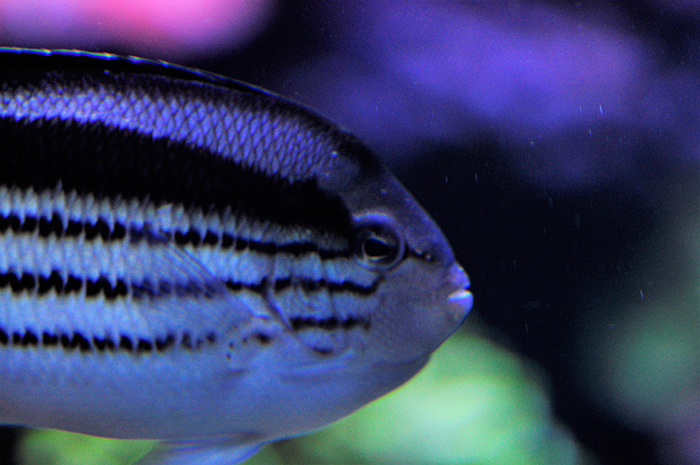 As far as Angelfish, we only have a few species to work with. Most of these angels fall into the Genicanthus genus. 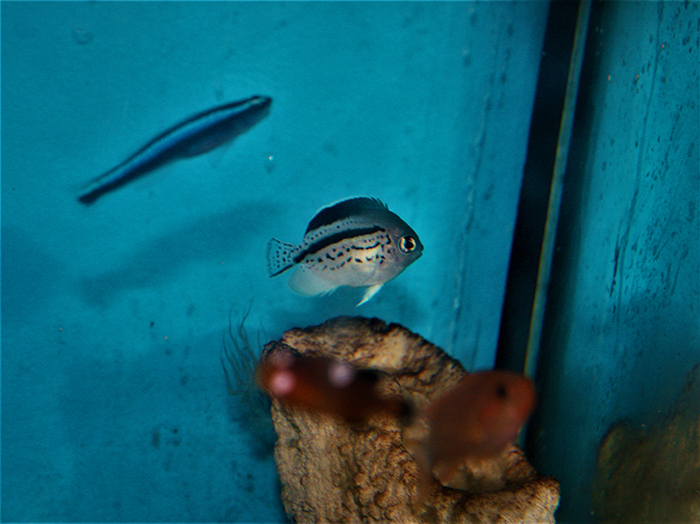 We have five out of the ten species in this genus in the tank, they are as follows: Genicanthus bellus, Genicanthus watanabei, Genicanthus melanospilos, Genicanthus semifasciatus, and Genicanthus lamarcks. Reef Tank Genicanthus. Photo by Noel Heinsohn. These Genicanthus have been spawning in our reef tank for many years. In fact, Todd Gardner came really close to settling some out a few years back when he worked at the aquarium. Spawn quality has definitely improved over the last few years since new foods have been introduced to the exhibit on a regular basis. This has without a doubt played a vital role in my success. At the aquarium, I have the option of either collecting eggs from the reef tank or rearing something from my broodstock system. In my broodstock, I have quite a few different species paired off. When I get the chance to rear fish I have to observe which species in my broodstock systems are currently spawning. Depending on my choices, I then determine how much effort and time will go into raising those species. Finally, I decide whether or not I should invest in those species at that moment, or if I should collect from the reef tank and try to get something new. 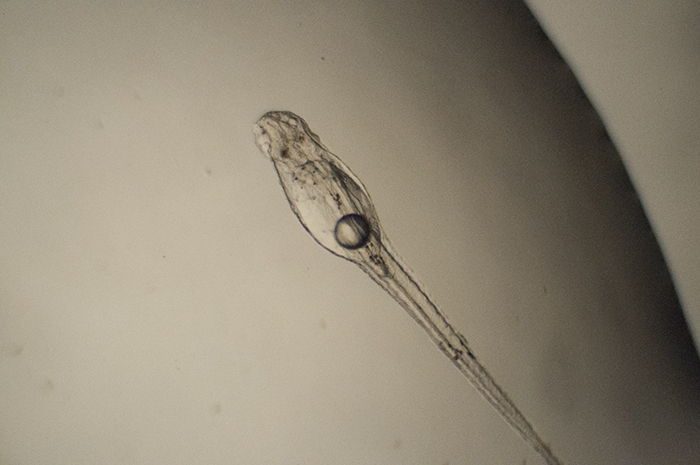 Genicanthus egg. Photo by Noel Heinsohn. Clutch of Genicanthus eggs. Photo by Noel Heinsohn. Lately I’ve been collecting from the reef tank. I use an 8ft long plankton tow that is 500 microns with a 3ft diameter opening. 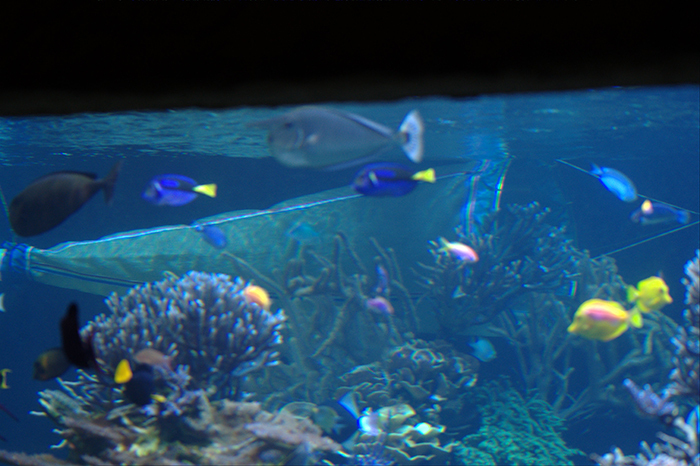 This plankton tow is hung from a fiberglass grate walkway that is above the reef tank. It is set right in front of a prop unit that is in the back right corner of the tank. This provides a majority of the flow for the tank and creates a great environment to collect eggs from. The plankton tow is set around 5 pm and stays in the tank until about 9 am. Giving an opportunity to collect both dusk and dawn spawns. When I remove the net I gently rinse it in the tank to wash any eggs that might be on the side of the net down into the collection cup. I remove the cup from the tow and set it to the side to let the eggs settle out. 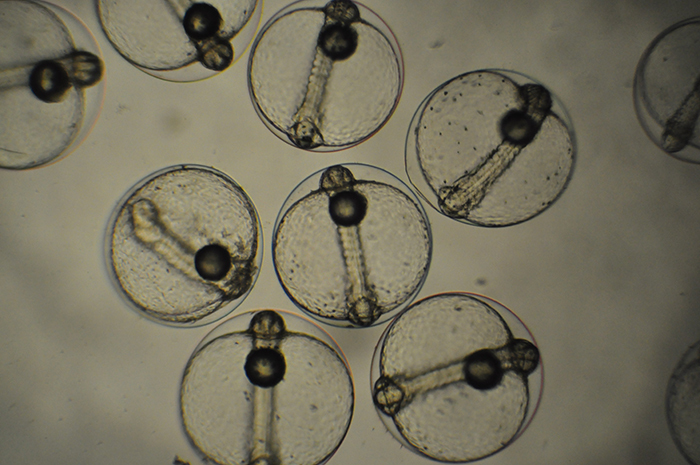 Most pelagic eggs are positively buoyant. Their buoyancy can be dependent on different factors ranging from broodstock nutrition to differences in salinity. At 35 parts per thousand (ppt) these eggs should shoot up to the surface with no problem. At lower salinities, they tend to hang out mid-water column. So by letting the eggs sit for a few minutes, it allows the detritus in my collection cup to sink to the bottom and the eggs to float to the surface. I then separate the eggs out with a pipette into a smaller container so that I can get a rough estimate of how many eggs were collected. On average I can get anywhere from a dozen eggs up to several thousand. Plankton tow in the 20k reef tank. Photo by Noel Heinsohn. After the eggs are counted I move onto sterilizing them. Our reef tank is such a thriving habitat that there are all sorts of bacteria and other predators that are great at killing newly hatched larvae. The eggs take a quick 10-minute bath in Ovadine – an iodine product made for sterilizing eggs. After the bath, I give the eggs a gentle saltwater rinse. I move them to a 2-liter conical glass container with some rigid airline tubing. 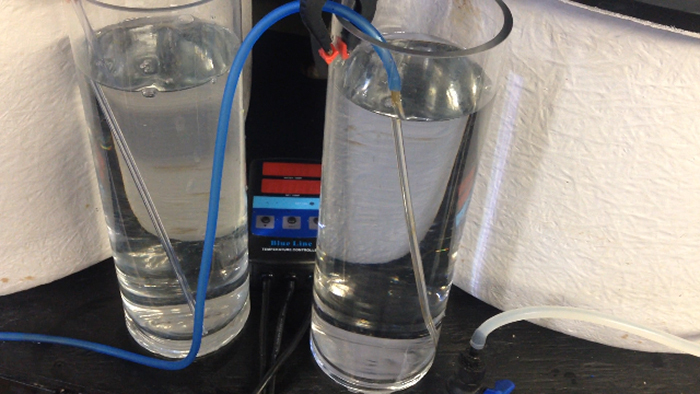 The tubing is set to a slow setting of two bubbles per second aeration. I leave this going all day. At the end of the day, I put them into complete darkness and leave them at room temperature, which stays at about 75 degrees Fahrenheit. This method usually results in hatches that are around 90% of the clutch. Glass hatchers. Photo by Noel Heinsohn. Once the eggs are hatched, I move the prolarvae into one of my larval rearing tanks. After working for a few years at the aquarium, I have come to acquire many variations of larval tanks. 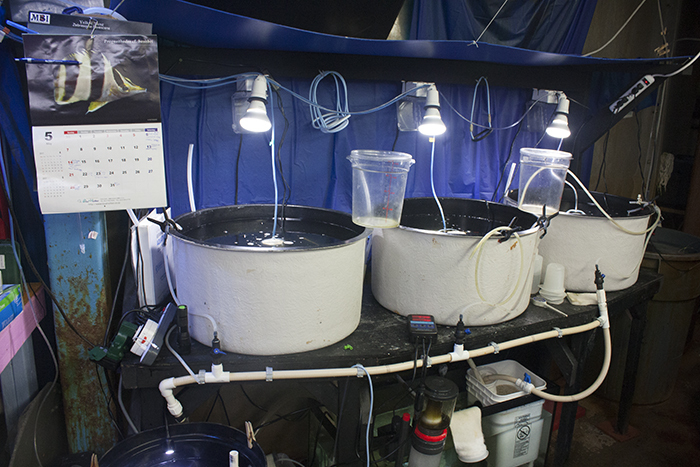 When I first started, I inherited Todd Gardner’s rearing tanks from his time at the aquarium. Since then I have bought other tanks or received some as a donation. Recently I acquired one of Roger Williams University’s fancy MoLaR systems (Modular Larvae Rearing). 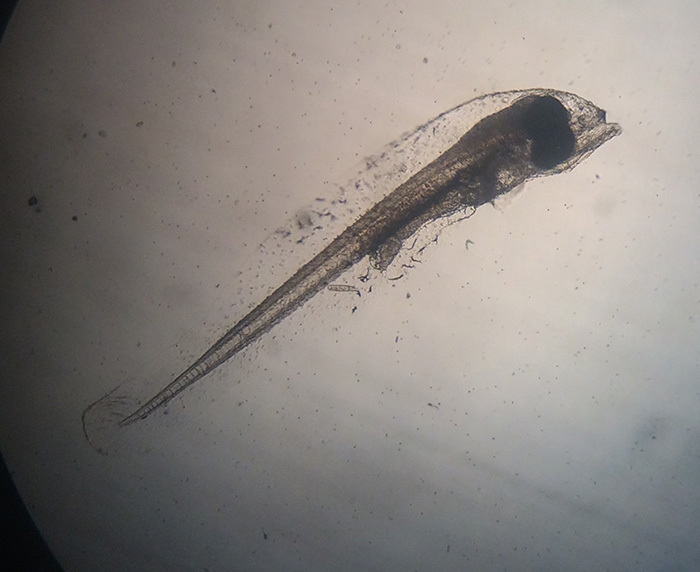 Like many other public aquarists, I was lucky enough to attend one of their larval workshops where they train aquarists how to culture fish larvae. They have lectures on larval system design, live foods, broodstock conditioning, and larval rearing. At the end of the 5-day workshop, you receive this schwifty new larval system. 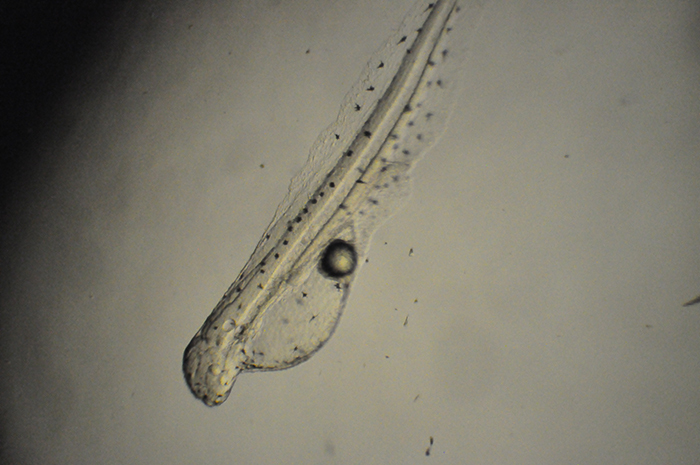 At the end of the workshop, I had learned many new techniques, which reignited my passion for larval rearing. MoLaR system (Modular Larvae Rearing). Photo by Noel Heinsohn. Genicanthus prolarva. Photo by Noel Heinsohn. With this particular trial, I started the prolarvae out in one of my 50-gallon larval rearing tanks. They are stand alone tubs with no filtration, made out of black Polyethylene. Only a light aeration from an airstone, a 150-watt titanium heater, and a small 10 watt LED from the hardware store. When I set this rearing tank up I used ESV’s salt mix. I prefer to use this mix because I have control of the concentration of elements going in. It also mixes really quickly which is important for my schedule. After I fill the tub with RO and mix in the salt, I bleach the water with 30mLs of household bleach. I let this heavily aerate overnight and add Sodium Thiosulfate in the morning. I let this go for 24 hours before adding in any larvae. 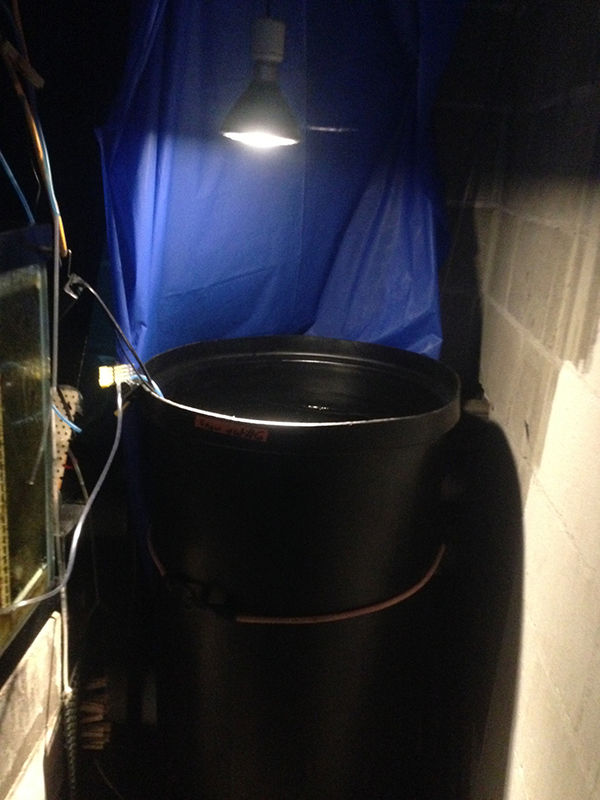 50-gallon larval rearing tank. Photo by Noel Heinsohn. At the aquarium, I culture 3 different species of copepods that I originally acquired from Algagen. Parvocalanus crassirostris, Pseudodiaptomus pelagicus, and Apocyclops panamensis. This gives me a variety of sizes and behaviors to entice larvae into eating. Each culture is setup and maintained similarly. The Parvo and Pseudo cultures are fed 5 gallons of algae every other day. 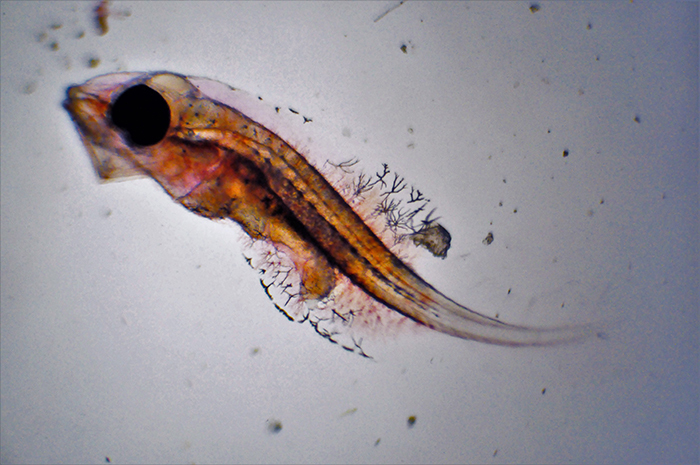 The Apocyclops culture is fed 30 mLs of Algagen’s nano paste every day. I harvest from the cultures either on a need basis or once a week if I don’t have any larval projects going. When I need to harvest from them I take off my 30-micron screens and allow the copepods to overflow into a stand pipe. This then drains into a basin below where I can place a sieve for collection. I put whatever sized sieve I need in here depending on what I am feeding. Besides harvesting the cultures, they also get a flow through water change every other day before algae is fed. I just leave the 30-micron screens on and put on a slow drip for 5 hours. The flow through does about 5 gallons an hour resulting in a 25-30-gallon water change. This is important since the bioload is so high. I take each culture down every 6-8 weeks for cleaning and bleaching. I then set it back up with UV sterilized water and begin again. The cultures have a light aeration and no lighting. This allows me to collect more nauplii and adults than I could ever need. My jellies and non-photosynthetic corals get what I don’t use for larvae. The Genicanthus I have worked with thus far all seem to have similar developments the first few days. 2DPH they begin to develop eyespots. These are very light-sensitive organs that can sense light and dark but are not developed eyes. At 3DPH their mouths begin to develop and they are ready to feed. 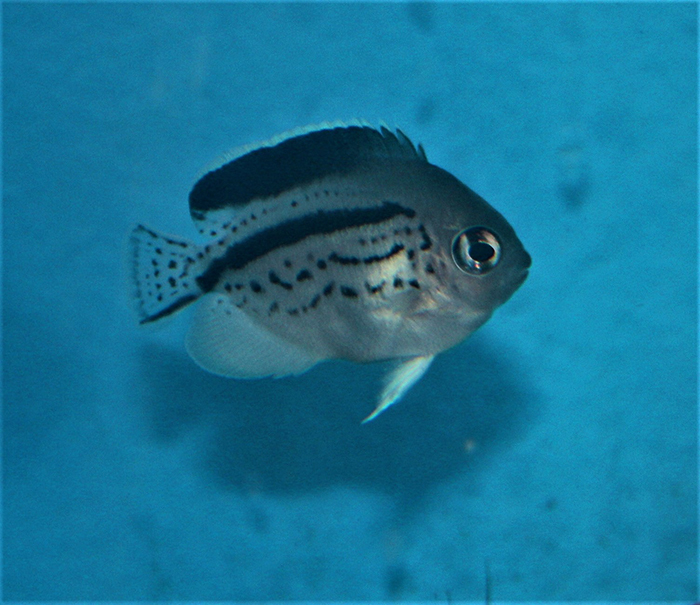 The angelfish larvae’s initial diet consists of Parvocalanus crassirostris nauplii. 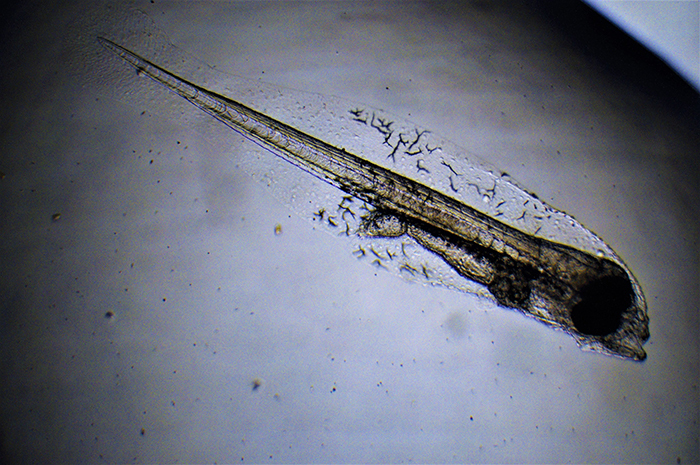 I make sure to only harvest the smallest nauplii that are between 50 and 70 microns from my cultures as these are the only sizes the newly hatched larvae can feed on. I drip the nauplii in with 4 liters of Isochrysis algae. The algae helps serve two important functions. First, it helps enrich the copepods in the rearing tank. Second, it helps keep the tank dark. With the tank being dark it allows the larvae to reserve valuable energy. Instead of having to chase after the copepods, they only have to feed on what swims directly in front of them. The only downside is that you have to make sure that enough food is added for the larvae to easily find. In my case, I tend to add approximately 1 copepod to 1 mL ratio. You can imagine how hard it is to keep up with the algae with the amount of food going into the tank. Genicanthus larvae 3DPH. Photo by Noel Heinsohn. Genicanthus larvae 4DPH. Photo by Noel Heinsohn. Thankfully the Long Island Aquarium has a very talented algae culturist on staff. 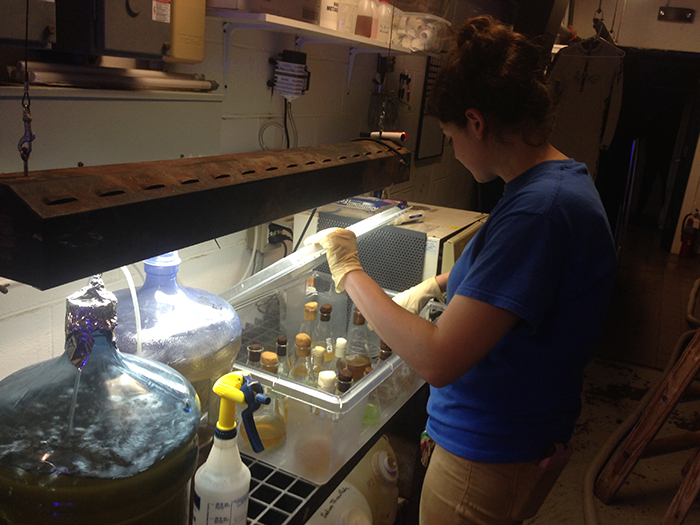 Katie Marino, a graduate of Roger Williams University, splits her time as an aquarist and growing algae for the aquarium. She has grown many types of algae over the years, but currently we are only culturing Isochrysis and Chaetoceros. We have a standard three step process: from flasks to carboys, to 30-gallon fiberglass cylinders. It’s very important to try to keep everything as sterile as possible. We have 8 cylinders that can be set up at a given time but we generally only use 4 or 5. Katie Marino, the algae culturist for the Long Island Aquarium. Photo by Noel Heinsohn. As with almost every species; I have worked with, getting them to survive past the first feeding has always been the greatest hurdle. A combination of types of food and environmental conditioning is very hard to replicate in a captive setting. By 6DPH I will know if an angel larva is feeding or not because it will have starved by now if it isn’t. 5 days is the last time a Genicanthus larva has any reserve egg yolk to feed on. So at 6 days they will either have food in their gut or starve. Usually depending on the amount of eggs, I am working with, I will have about 30-50 larvae left to work with. Genicanthus larvae 6DPH. Photo by Noel Heinsohn. This number will start dwindling as the days go on for one reason or another. I continue to add algae every day, and copepods when I see the density start to plummet. I don’t have to add many copepods because they begin to co-culture in the larval tank. I usually add so many nauplii in the beginning that many will reach maturity before being consumed. Genicanthus larvae 9DPH. Photo by Noel Heinsohn. Between 10-14DPH I begin doing routine maintenance. This includes water changes and regular RO top off. Every morning when I am doing larval checks I will check salinity and temperature to make sure everything is on par for what I want. In the MoLaRs, I begin to do small flow-throughs of system water at a 2 drips per second rate for the course of the day. I do not leave these going overnight incase of a malfunction or unforeseen screen clog that would cause them to overflow. On my stand alone 50-gallon larval tanks I take some airline tubing and put an airstone on the end. I drop it about 6 inches into the tank and begin to start a slow siphon that takes a few hours to drain the tank. After it is done siphoning I start adding new ESV mixed saltwater back into the larval tank 5 gallons at a time. I will do this about once a week for the first few weeks. Genicanthus larvae 15DPH. Photo by Noel Heinsohn. Around 30-35DPH Genicanthus go through the process of flexion. This is where the notochord bends 90 degrees upward at the end to help form the caudal fin. This process is extremely stressful and you will tend to see a loss at this point. 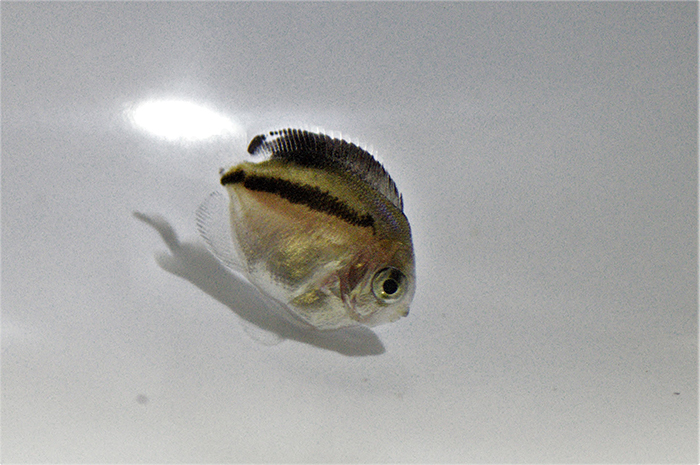 It is also the point in angelfish larval cycles that they enter what I call the “Pearly Stage” which is when the larvae begin to undergo a big physical change. They stop having a generic larvae look and instead become quite thin and circular. This is true for most angelfish species. Pearly stage Genicanthus. Photo by Noel Heinsohn. No matter what techniques you use to rear larval fish there will always be things that are out of your control. Rearing fish at an aquarium is not as easy as one might think. Sure there are a lot of benefits and plenty of resources, but for each positive, there is a negative. Some of the biggest issues I have is that we are a facility with many different functions. This means at any given time I could have people passing by my larval tanks doing who knows what around them, outside factors like doors being left open and creating temperature swings that larvae are not tolerant of are common. One of the most common issues we have is power outages. These are very common in the winter time, whether it be from a storm, or someone hitting a power line in front of the aquarium (which happens more than you would expect). While we have a backup generator that runs most of the aquarium in the case of a power outage, there isn’t much we could do for my larval tanks. A slight surge in power will cause the lights to flicker and give little 30-day old Genicanthus heart attacks. Dead Genicanthus. Photo by Noel Heinsohn. After one of the power outages happened I decided to move the remaining 5 Genicanthus to the MoLaR system. This allows me to improve on a few things. I can drip water through the tanks to make them part of a larger system. This improves water quality and gives me the ability to remove foods that are now too small for the angels to feed on. It also allows me to have the ability to have different types of filtration. On the MoLaR system, I have a UV filter, some filter socks, and a protein skimmer. Also after the first power outage, we made the decision to purchase a backup battery. This allows for uninterrupted power for up to an hour in the case of an outage. Since purchasing this battery I have had to use it more than a few times, and with summer coming up and everyone blasting their AC units I am sure I will have to use it a few more. When the day came to move the larvae I carefully caught each one in a small plastic 8oz cup and moved them into a clear container. I acclimated them for about an hour before carefully moving them into the MOLAR system. I tried to match the water chemistry as much as possible so the day before I removed 10 gallons of water from their larval system to start up the MOLAR. I made sure temperature was consistent between the two systems (76F). I carefully scooped them out of the clear container and moved them into the MOLAR. Right from the start, I saw good responses from a majority of the larvae. 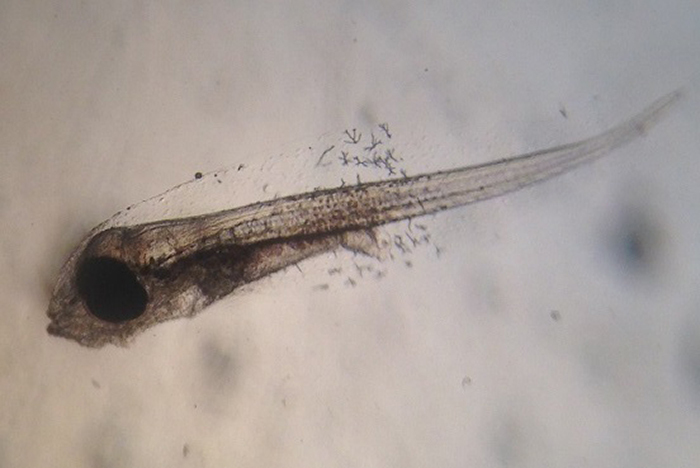 Two even started to eat copepods in the MOLAR within an hour. Unfortunately, by days end two had passed from the stress of the move. A few days passed and I lost another of the three. With only two remaining I wasn’t sure if I would get any of these larvae through to settlement. At this point, they were being fed a mix of live foods. 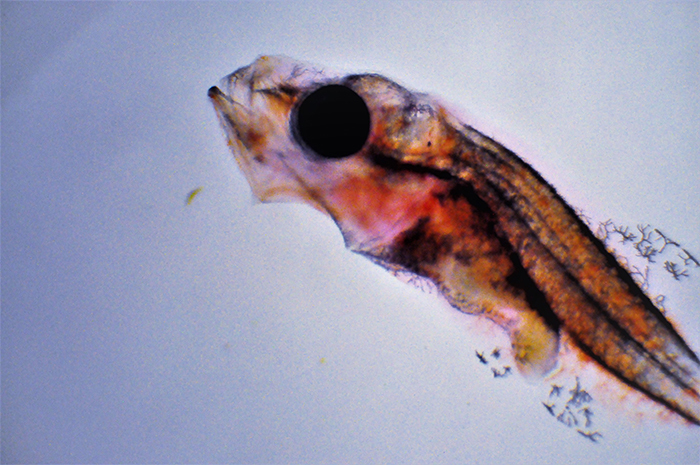 Artemia, Parvo, and Pseudodiaptomus were all part of their diet. Fast approaching 50 days these larvae were huge. Having spoken to Karen Brittain previously about her successes rearing Genicanthus, I knew I was still about a month away from settlement. But since it had been a few weeks since the last death I was feeling hopeful about these two. That hope began to fade. The larger of the two larvae started to freak out at the surface. It would be swimming fine for awhile, and then he would approach the surface and begin to swim erratically. I thought that it might be a light sensitivity issue so I dimmed the lights and started adding more algae into the water. This seemed to help a bit, but the symptoms remained. Unfortunately, after hanging on for several more weeks the larva finally died. After each and every brutal and heartbreaking hurdle I have faced in this run nothing was more devastating than the loss of this larva. It seemed like my efforts were doomed. I felt as if the day of settling a Genicanthus was never to come. Losing the larger larvae did not give me much hope for the smaller larva. But I continued my efforts. At this point, I knew settlement had to be approaching soon. I had hit the 70-day mark. I stopped feeding Artemia every day as I was worried that it might have caused nutritional issues leading to the other Genicanthus‘ demise. Days later the larva had really gained some size. It had started to spend its time hanging around the heater. I added a few 1″ PVC T’s into the tank to give the larva something to associate with. After a few days, I came in and couldn’t see the larva anywhere. I had figured it had gone into one of the PVC pieces. So I added some food into the tank and low and behold. 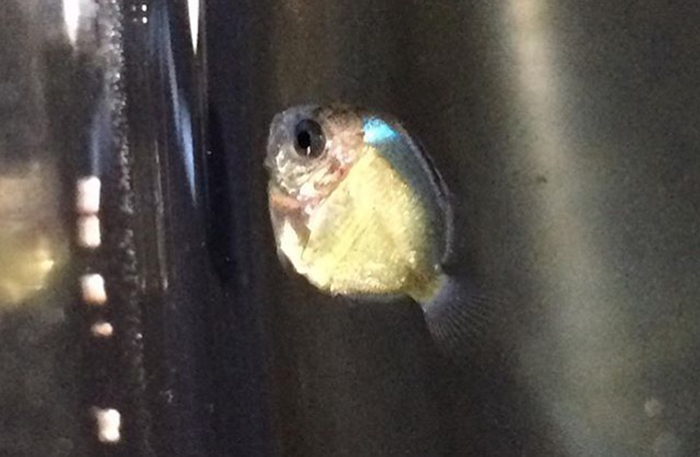 A newly settled 82-day old angelfish appeared out of the PVC. It was like Christmas and my birthday wrapped into a little bundle of Pomacanthidae goodness. I could hardly believe it had finally happened. For the first few days of settlement little color had developed. At least nothing that could narrow it down definitively. 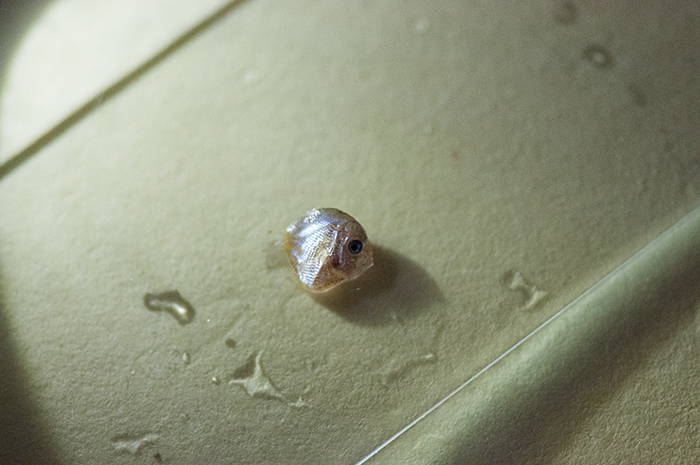 It was a pretty generic looking juvenile angelfish. But that wouldn’t last for long. Day 86 came along and she had gained a striking black stripe. As her pigment solidified I could easily identify her as Genicanthus larmack! Newly settled Genicanthus. Photo by Noel Heinsohn. There comes a point in every aquaculturist’s life that is both the most exciting, but also the most stressful: Moving day. After spending 120 days in my larval tank it was time for the Lamarcks to move out, meet new people and get a job. Being extremely careful I scooped up the angel in a plastic deli cup and carefully lowered it into a blacked out bucket where I began its acclimation of 3 hours. There was light aeration and a drip line in the bucket to give the angel all the time it could ever need to adjust to its new system. After I decided that it had been long enough and the angel was either going to be ok or the world was going to end, I once again carefully scooped her up and added her to one of my growout systems. Her new roommates were a pair of 4th generation neon gobies, and a yet to be identified captive bred Pseudanthias. When I first decided to move the angel it took me sometime to decide where I was going to put it. After a lot of consideration, I decided to add it to this tank. I wasn’t sure how it would get along with the anthias, but I gave it a shot. From the very first moment of being introduced into the tank, they have been best buds. They even sleep in the same rock. Settled Genicanthus. Photo by Noel Heinsohn. Back around 70DPH, I began to offer the nearly settled Lamarcks frozen diets. 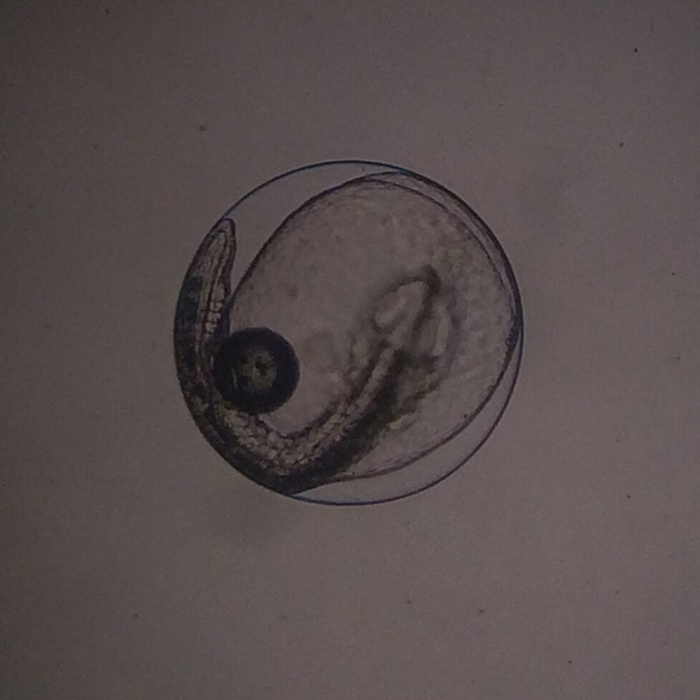 At first I started with Jehmcos Frozen Cyclops Copepods which the larva quickly started eating. The next step was to offer frozen mysis and shredded up Larry’s Reef Frenzy. It took a long time for the angel to show any interest in these foods and it wasn’t until it was introduced to my captive bred anthias that it finally started to eat them. As this article is being written I am well into working on the next wave of Genicanthus to see if I can’t improve upon my success. As of now, I have several trials running spanning from 6DPH up to 40DPH. The 40DPH angels have already passed through the “Pearly Stage” and have developed into little round larvae. I have seen some improvement since my previous trials in early development. The lone surviving Genicanthus. Photo by Noel Heinsohn. I will be working with these larvae for the foreseeable future, constantly trying new techniques. I have no doubt in my mind that these techniques can be improved upon and it is my hope to raise more this year. I am going to try and figure out how to separate the angelfish eggs from the anthias eggs so I can know exactly what I am working with from the very beginning and see if I can improve survival. Genicanthus and tank mates. Photo by Noel Heinsohn.